The K²n Platform is a continually evolving cloud based Data Aggregation and Reporting Platform that uses a radically different approach to existing energy monitoring and reporting systems. The K²n Platform generates bespoke profiles for buildings, spaces, systems and components (HVAC, lighting & small power). This is made possible by 7,000+ unique benchmarks at the component, space and activity level. These benchmarks enable the K²n platform to generate reports down to space and component level on a sub-hourly basis, as well as the ability to help improve buildings and systems use by highlighting energy conservation opportunities. 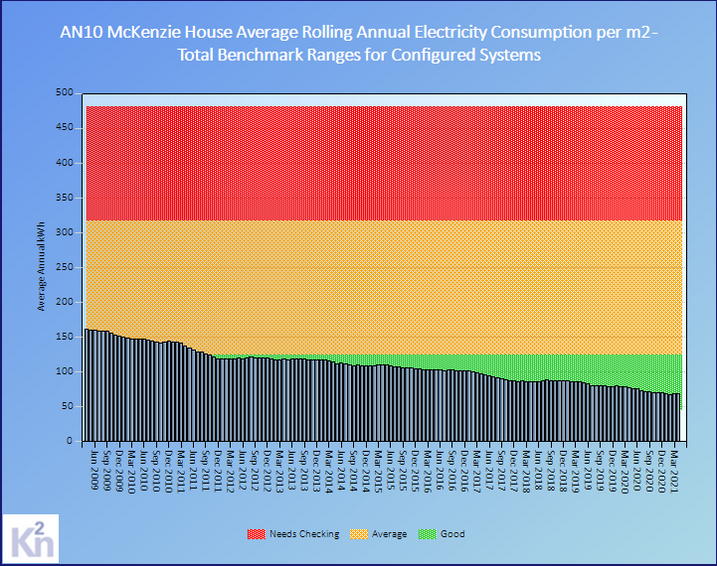 Using the K²n process, McKenzie House, a twelve storey Cardiff University Office building, has reduced its total annual electricity use by ~50% over a period of 12 years. The platform is designed to combine estate asset details with operational data, from monthly down to sub-hourly detail, to enable clarity about where action should be taken to improve utility use and internal conditions. Tailored benchmarks are produced for each building's unique blend of activities, areas and systems. It is a neutral platform in terms of assessing performance. K²n uses its own unique benchmarks, derived from ongoing achieved performance by all assets on the platform. The benchmarks exist at the level of components, activities and spaces. This detail, combined with operational data, enables the platform to calculate achieved operational performance from the level of a country right down to individual activities, spaces and components. The platform enables the detail for buildings and estates to be assembled over time from a simple initial basic data requirement, enabling a structured move towards using operational data in the management of assets. The asset and operational data collected is stored in an industry standard database format, enabling easy data transfer into and out of the database. Experience of operation across Europe shows an average Return Of Investment > 200%. The platform's database contains nearly 2,000,000m² of building space and 250,000,000 sub-hourly meter readings. This large store of data enables the K²n system to be able to calculate and refine the 7,000+ unique benchmarks.